Jake Webster scoring a try for Castleford Tigers at Wigan. In-form Castleford Tigers centre Jake Webster has announced his intention to keep playing beyond this year and hopes to win a new contract with the club currently sitting on top of the Betfred Super League. Webster has made a storming start to the 2017 season and is forming part of an increasingly potent right edge attack being developed at Castleford. The 33-year-old former New Zealand international believes he is playing some of the best rugby of his career. He said: “I am really enjoying it. It is hard not to when you’ve got players like these around you - it makes my job a lot easier. “Hopefully we can come to some agreement soon and get pen put to paper. I feel young again. I am going backwards - I am 33 going on 23. Webster reckons the Tigers’ latest win at Wigan will give the side extra confidence. He said: “It was a great win. I can’t remember the last time I had a win there, it has been such a fortress. 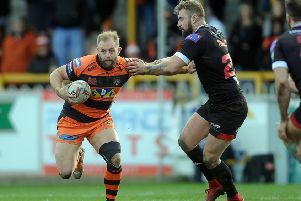 Webster is expecting a tough challenge now in Friday’s local derby with an also in-form Wakefield Trinity at the Mend-A-Hose Jungle. He added: “They are going well, they are full of energy and enthusiasm and they’ve got a good set-up there. “We are going to have to be on our game for sure. I’ll be up against Bill Tupou. I’ve come up against him a few times and he’s big and strong.